The Saturday night puppy match that I prepped, washed & packed for is over. I never did end up showing Zaria as she was like a lead balloon at the end of the lead and brother Zeke...aka Tyson, actually took 4 or 5 steps in the ring. Things went better with my niece Melissa's boys, although Hank got dumped,he is a growing gawky puppy right now, and this was the first time for him in the ring, and he showed very well. Housemate to Hank is Vader and he won his class. Sunday was another day, but unfortunately I couldn't be there due to prior commitments. Today Zeke...aka Tyson, acutally went around the ring AND won his class (only he was the only one in it), Melissa's two boys Hank & Vader both won 2nd in their respective classes, and my girl Vanna...aka The Almighty Vanna won her class (only she was the only one in it). All in all is was a lot of fun, wish I could have been there on Sunday, but it was great to see Kristen, Karen & Pat again who drove up from a race club meeting near Baltimore on Saturday night. Congrats to all the winners and we'll see ya down the road. Getting ready for a show is a big deal round these parts. I've baked the liver, done the laundry, got all their walking collars and leashes, put in drinking water for dogs and humans, resupplied the tack box, put crates, expens & chairs in the van, made sure I have their dog coats (cause it's cold outside), bathe dogs, clip nails and made sure the dogs are good and dry (did I mention it was cold outside??? ), made sure I have something for son Tyler to do, pack snacks & drinks for humans and pack liver in cooler. Hope & pray I have everything I need, and stuff that I probably won't need, but packed it anyway, load up dogs and off we go. And this is only a PUPPY MATCH show!!!!! As I sit here typing on my computer I look over to see some of my fur kids sound asleep on their beds. They all have their favorite spot, the princess of the house Emily, likes her worn bean bag chair bed, Vanna & Lilo love the cozy cave bed, and Paco tries to lay where it's cool (she's the longhair mutt). They are so content in their own space, but they also love to snuggle with each other. At bedtime, Paco sleeps with his boy, my son Tyler, Emily sleeps in her worn bean bag chair bed that gets drug upstairs into the bedroom and Vanna sleeps in bed under the covers until she gets hot, then out, then in, then out, then in.....well you get the picture. I love the look of contentment on their faces when they sleep, and it gives me a feeling that I'm doing right by them. Last post for the day, promise. I have to introduce the most famous Whippet carrying the Eclipse banner. MBIS/MBISS Am/Can Ch. Eclipse Envy of Sporting Field. 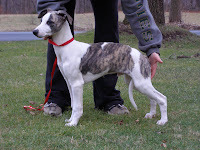 Zoey was the #1 Whippet, #3 Hound, #25 All-Breeds in the nation in 2005. 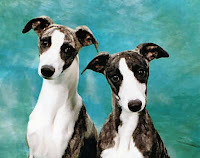 She is the winner of several Whippet Club Specialty Shows in the US and Canada, and was named Canada's Hound of the Year in 2003. Her amazing record in the US of 18 All-Breed Best in Shows is one that will be hard to match. She also won Best of Breed and Group 4 at the prestigious Westminster Kennel Club in 2006. Zoey is now retired and living the good life on the sunny beaches of Ft. Pierce, Florida. Thanks for the retirement home J. 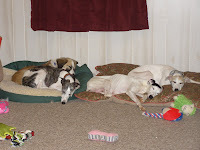 Here are Jaycie & Cinder, two very typical whippets you will find here at Eclipse. They are loving and playful, as puppies should be. They are from different litters, but both were born in October 2005 only 2 days apart. What a cute pair!!! Hi everyone and welcome to my blog. Here I will add little ditty's now and again about the life and times of the Whippets and other dogs and humans here at Eclipse. 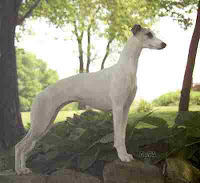 I have been an active breeder/owner/handler of Whippets since 1990, and could tell you lots of stories from times way back when. I wish I would have known about Blogs years ago, but I didn't so I'll just have to start my stories and adventures from now. But know this, I'll throw in lots of stories from long ago, so check back often. Sit back, relax and enjoy my blog.